Britain’s women grapplers take to the mats to support the sport in their home country. Following the success of the first two, the third Women’s BJJ London Open Mat was held on Sunday 7th February 2010 at Dartford Martial Arts Academy. The London Women’s Open Mat has created a safe and relaxed environment for the UK Women of BJJ to come together and share experiences, techniques and knowledge in an open forum. 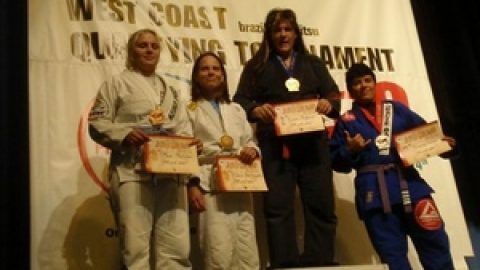 Unfortunately there is still a lack of women in BJJ and Open Mat’s like these help encourage women to the sport, welcoming everyone from complete beginners to as high a level as they come. This quarter two of the women were fresh from the Ana Maria India Seminar the previous day kindly shared some of the techniques and knowledge learnt, following this there was a light spar to warm up and a “King of the Hill” sparring session, which I would highly recommend. I think the biggest benefit of a women’s open mat is the opportunity to come together and learn from each other’s experiences. We don’t often get to spend time with other women in BJJ unless it is in competition, so it’s a great opportunity to see how you are progressing without that pressure. I would like to thank everyone who attended and Meg Smitley of Dartford MMA for making it possible and hope that many other clubs take the idea and we see many more Women’s Open Mat’s popping up!